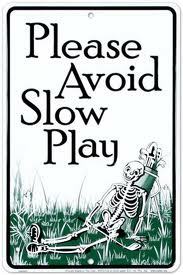 I wrote some pieces on Slow Play last year... it took me three blogs to do it. Perhaps that's because it vexes me so and I need time - lots of it - to vent my frustrations. At least I don't play as slow as I type. Play more quickly, play better and have more fun! It makes sense and why not give it a try. You could make a strong suggestion to your club pro and club manager to introduce a similar promotion within your club! This is great by the USGA and I wish them every success. I have signed the pledge, here is the link USGA sign up to the pledge and why not. A faster round of golf is in every golfer's interest. John also works in golf tourism. Check out his Concierge Golf website. As a Yank, it's interesting to see comments criticizing slow play in Ireland. My experience in Ireland was that the pace was much quicker and more enjoyable. 1. Courses should mark more areas as lateral hazards, at least for casual play. We all know the common spots where people wander precious minutes for lost balls. Designate them as hazards, with liberal drop areas, and you will save considerable time. Few things are worse than seeing somebody spend five minutes looking for a lost ball, find it, and then hit three trees in a feeble attempt to punch it back into play. 2. Encourage match rather than stroke play, while still encouraging the concepts of ready golf. 3. Require people to pick up as soon as they hit their max unless they are a full hole ahead of the group behind them and on pace with the group ahead of them. Hey, I love my brother, but I gain nothing from watching him line up a twelve footer for a triple bogey (I'm sure he feels the same way about me). What are your worst mistakes on a golf course?